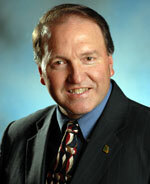 The word is out and the NAMA Agribusiness Leader of the Year is Dale Ludwig, Missouri Soybean Association. I just saw Dale at Commodity Classic and congratulated him. I guess we’ll see him in Dallas. The National Agri-Marketing Association has named Dale R. Ludwig, executive director/CEO of the Missouri Soybean Association and the Missouri Soybean Merchandising Council, the 2007 Agribusiness Leader of the Year. This award, which is NAMA’s highest honor, will be presented at the Opening General Session of the 2007 Agri-Marketing Conference, “Think Big!,” April 12, 2007 in Dallas, TX. The award honors outstanding leaders in agribusiness, education, government service or other agribusiness related areas who exemplify excellence in agribusiness by their significant contributions to the industry. Ludwig is a visionary leader with a proven record of building coalitions to improve Missouri agriculture. He helped forge producer/agribusiness partnerships that have positioned Missouri as a leader in biodiesel production. In addition, he pioneered the effort to identify new traits in soybeans through biotechnology and helped re-position the U.S. soybean commodity with competitive advantages over global competitors.